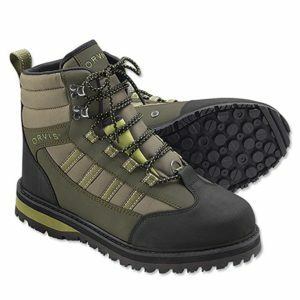 For around $120 the Orvis Encounter wading boots are appealing even to novice anglers. Orvis promised that the Encounter offer the quality and features of high-end equipment for a price that’s still fairly affordable. I tested them to find out if they are worth buying and how they perform during an average day of fly fishing. In the following article, you can read my conclusion and their review. Targeting people that just start out with this sport, Orvis made a pair that already became popular even among seasoned fly fishers. 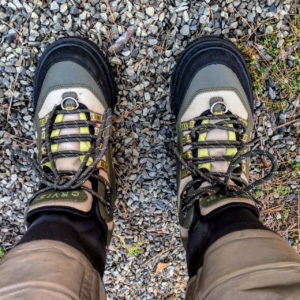 In this review I tested the Orvis Encounter Vibram rubber version as I try to avoid felt soles since they are banned in many states for supporting the spread of invasive species. They were definitely wading boots I was looking forward to reviewing, hearing a lot good stuff about them, I was eager to try them out myself. If they hold up to what they promise they could definitely be a great choice for the average beginner wanting a quality product that doesn’t break the bank. Starting from top to bottom the Encounter come with an upper made completely from synthetics. This is supposed to ensure a well-working drainage system and an overall lightweight product. The collar is padded for better ankle support and the heel of the shoes doesn’t feel too stiff. The inner of the boot comes with a sponge cushioning which provides comfort while barely weighing anything. Their “welted” build is advertised as being an especially sturdy form of construction that outlives many other boots in its price range and yes, you can definitely tell that it’s decent quality what you get for that price. They come with a rubber heel and toe cap to protect the synthetic materials as well as your feet and a metal D-ring is attached onto said toe cap, to hold your gravel guards in place. If everything holds as it’s supposed to, the tongue of the boots in combination with a gravel guard should keep any debris outside. With the exception of the first two hooks, the lacing system uses nylon loops instead of metal, to hold the shoelaces in place. This can be a plus for people using them in saltwater since those are the parts that rod out first when in contact with the ocean and made out of metal. This seems to be a common problem with the Simms G3 Guide Boot for instance. 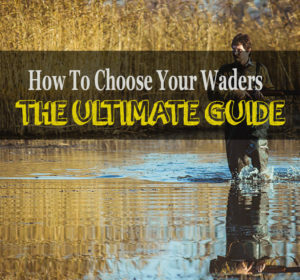 As mentioned in the beginning you can choose between rubber and felt soles and if you want to know the major differences in detail, check out our wading boots buying guide. Sticky rubber comes close if not even beats felt soles in terms of traction, as soon as you attach studs. Rubber is also far more durable, especially if you walk a lot between fly fishing pools. Additionally felt is banned in most states and if you want to travel with your boots, getting rubber is a way better choice. Enough reasons for me to choose a rubber sole once again for the Encounter and the offer a decent one as well. It’s Vibram rubber which, because of its remarkable traction,is often used for climbing shoes. People literally climb vertical walls with those Vibram soles, so they become more and more popular for wading boots. You will also find Vibram Rubber in the Simms G3 Guide Boots which cost almost twice the money. If Vibram doesn’t provide enough grip for you, the Orvis Encounter give you the chance to upgrade them with studs. They work well with PosiGrip studs that are easily screwed into your soles. One pack costs around 30 bucks though, so yes, maybe a little pricey. For my review I used my regular shoe size and everything seemed to fit perfectly. Nothing wiggled, no lifting heels. I would recommend having a look at their sizing chart so you don’t actually order the wrong size. Although it shouldn’t be a problem to exchange them for the right size, ordering right the first time saves trouble, time and nerves. You will also notice that they already plan in enough room for neoprene booties and wader socks, so they should work well with pretty much every pair of fly fishing waders. If you usually wear half sizes, buy the next bigger one. A shoe too large can be adapted with additional insoles and thick socks, while shoes too small don’t give you such an option. They offer decent ankle support and a padded collar firmly keeps your heels and ankles in place without being uncomfortable in any way. They are not feeling stiff neither do they limit the movement of your feet more than necessary. Exactly the right amount to prevent rolled ankles and sprains as good as possible. As this review would be pretty pointless without some real first-hand river testing I took those boots out for a fish. Putting them on at home already felt pretty comfortable so I was looking forward to testing them in the stream. Quite a few rivers around here but I decided to take them to a spot which requires a small hike before you reach a pool. Nothing big, around 2 to 3 miles depending on which pool you choose. I figured since I already heard people saying they perform well on day trips with longer hikes, I might as well test that first. To give you an idea what you can expect from those wading boots during such a walk, just picture how it would feel to hike this distance with your average pair of hiking boots. Yes, if they were hiking boots, they would be only average but for wading boots, they definitely performed well on the trail. Some steep slopes were mastered and some tricky rocks climbed. I did not have the spikes attached at this time but on land, the sole definitely provides enough grip, even without them. Arriving at the pool I left all my gear on the bank and just went for a few minutes of exploring the terrain, in and around the river. Although the grip was decent for rubber, I decided to attach the studs before I start fishing. I brought a hex screwdriver with me and using it, attaching the PosiGrip studs was a breeze. As expected, the difference it made was major. Stated in the beginning, wading boots with studs beat felt soles for me and so do the Encounter. Walking over mossy or muddy stones was as easy as you would wish for and I always felt like I had a safe standing inside the river. The toe caps are hard enough to take out the pain of any impacts your feet could encounter and all around, the performance of these wading boots was very convincing. For the next part, I usually want to get an idea of a wading boots drainage ability. To keep your boots lightweight, it is mandatory that this system works and lets water escape as fast as it enters. Stepping out of the river the boots lost weight slowly but steadily to a point pretty close to their dry state (at least that’s what I guessed). One thing I did notice though is that the sponge-like material used inside soaks quite some water. Nothing too bad, but I think that could have been easily prevented with another synthetic hydrophobic material. The second thing I noticed was something about the rings where you attach the gravel guards. I was wearing them for around 5 hours and those little metal loops were already slightly deformed. Maybe Orvis should have chosen something more sturdy here. Besides those two minor issues, the Orvis Encounter did their job great and I enjoyed wearing them. In addition to my experience, I asked Kati, a fellow blogger (gettingoutdoors.net) and owner of the fly fishing guide service Rouse Fly Fishing, for her review of the Orvis Encounter, since she recently started wearing them. Make sure to check out her blog for some interesting stories and great pictures! As you can see, the Pros outweigh the Cons by far on this model. The Orvis Encounter are a great choice for every fly fisher that tends to hike a little longer to their fishing spots or just looks for wading boots with Vibram rubber soles to replace the old felt pair. No matter on what level you perform this sport, you can’t really go wrong here and for that price, I can guarantee, you won’t regret buying them. Although they aren’t in our ranking of best wading boots yet, they will be in there, when we update it this month. You can get them at Orvis.com or check your local fly fishing store! Thanks for the review! I was looking for something more in-depth and after reading this I definitely getting my self a pair. Sounds like Orvis did a good job here! Came here from Pinterest! Hard to find a decent pair of wading boots for women, I’ll give them a try after reading this.